Spillways are an essential element of any water feature, they are designed to create a free falling sheet of water, (see picture right) or an even flow of water over water feature materials such as rock, glass or stainless steel as well as to help create a naturalistic effect at the head of a waterfall. Spillways are also used in swimming pools as a water return to add interest to the pool itself. 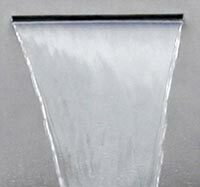 Adjustable flow spillways are also available. Most are Relatively easy to install with aluminium, stainless steel, aluminium, clear PVC and even glass designs available to suit and match the materials usedany water feature or pond. It is possible to see that as water leaves a spillway the sheet of falling water begins to narrow as it falls, (see picture above) it is almost impossible to have a free falling sheet of water that does not ‘pull towards the centre’. Large flow rate and a smoother flow of water will help. So spillway kits for waterfalls are a fairly specilaist design, any wide water flow will require some fairly precise planning and installation. All well worth the effort.